The Joker is up to his usual mischief and now Robin is missing! Can Batman find him in time? Find out in this Ready-to-Go! Ready-to-Read starring everyone's favorite caped crusader! 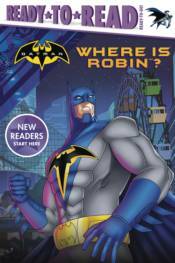 Perfect for kids at the beginning of their reading journeys, Where Is Robin? was written for children who have learned the alphabet and are ready to start reading! And what better way to get kids excited than with a fun story with words they can actually read and starring their favorite super hero? Each Ready-to-Go! story contains about 100 words and features sight words, rhyming words, and repetition to help children reinforce their new reading skills. In So come on and get reading with Batman!